CoCalc is a web application that lets you collaboratively use a large amount of free open source math and data related open source software. 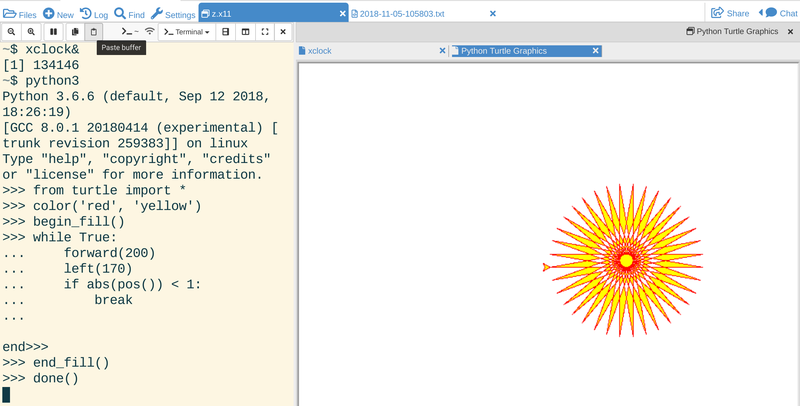 You can create collaborative Jupyter notebooks, edit LaTeX documents, use Terminals, use graphical Linux applications, create chatrooms, and much more. 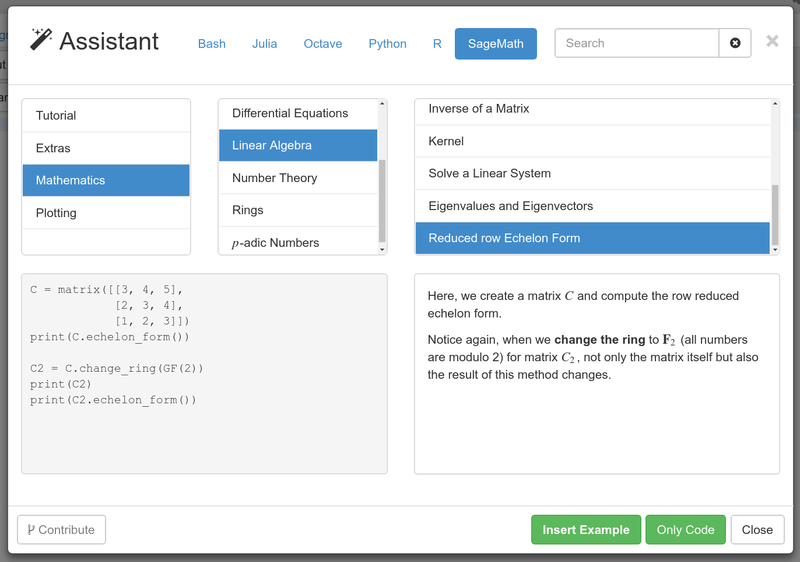 There’s extensive support for SageMath, Octave (a MATLAB clone), and R. See the docs. Cocalc-docker is a completely free and open source self contained version of CoCalc, which you can run on your own computer or cloud server. 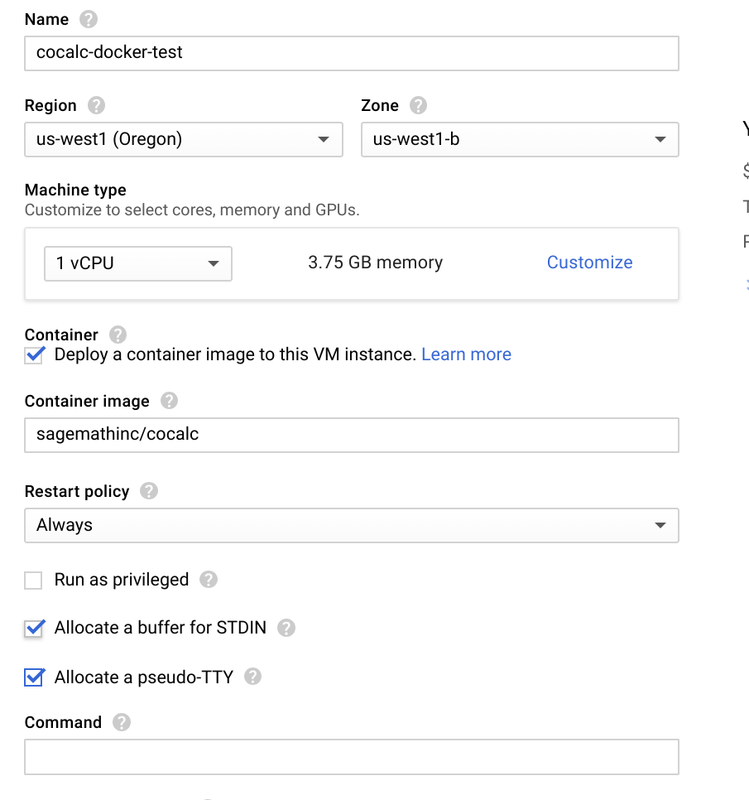 This post is about how to freely play around with running CoCalc-docker on Google Cloud Platform. 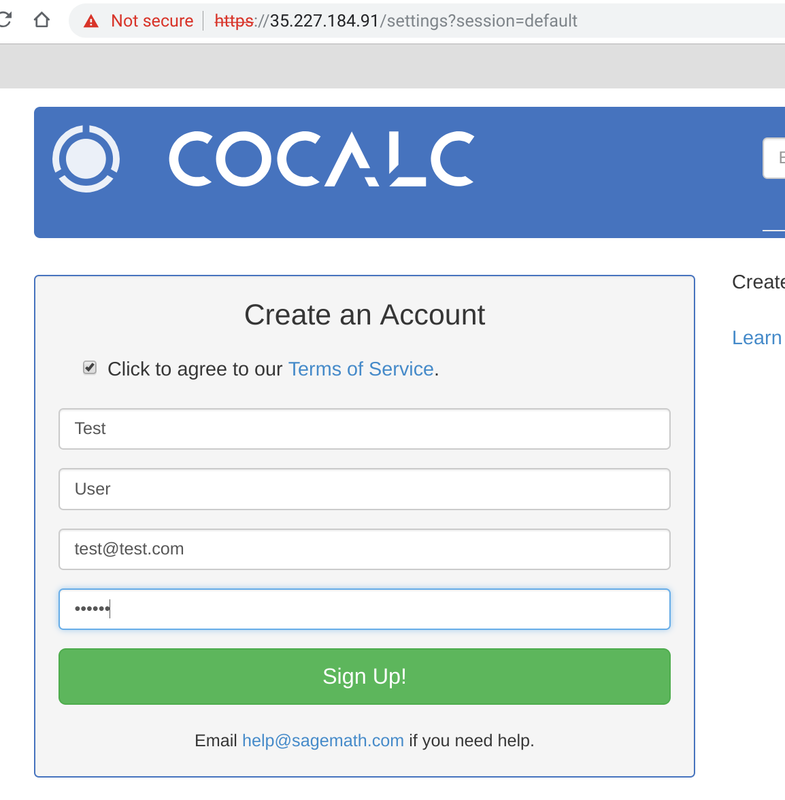 If you scroll down and see all the cool things CoCalc can do, but don’t want to bother running your own server, make an account at CoCalc and use our hosted service, which has filesystem snapshots, a vast amount of preinstalled software (much more than cocalc-docker), and support. Choose where to run the container close to you, for optimal speed! 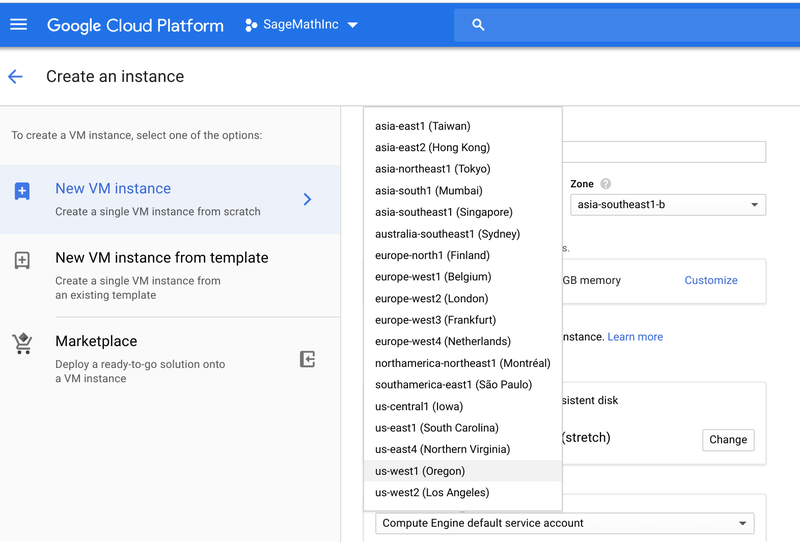 Click the checkbox next to “Deploy a container image to this VM instance.”, then put sagemathinc/cocalc in the blank below “Container image”. Also check the boxes next to buffer stdin and allocate a tty. You can also change the machine type, though the default will work. Increase Base Image Size to at least 20GB! CRITICAL: increase the base image size to at least 20GB! The default of 10GB will fail. If you are just playing around to test this out, open “Management, security, disks, networking, sole tenancy” and scroll down and set “Preemptibility” to On. 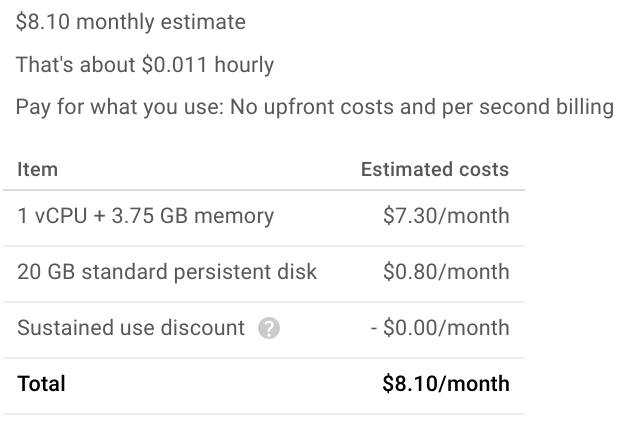 This will make things way cheaper (using less of your free trial credits). This is especially useful if you wan to do a relatively quick but very CPU intensive parallel computation. Here’s how our cost estimate comes out so far, with preemptible on. It would be about four times as expensive without preemptible on. Of course the drawback of preemptible is that the machine will be killed within 24 hours. That’s fine for testing things out though. Once the VM is created, click to open it, then click “Serial port 1 (console)” (or “Connect to serial console”), to watch the log as the machine boots up. It takes at least 10 minutes to pull and decompress the sagemathinc/cocalc Docker image. If this fails, you probably forgot to increase the size of the boot disk from 10GB to 20GB (or more), in which case you should delete everything and start over. Once your machine is running and the sagemathinc/cocalc image has been pulled and decompressed, find the external ip address of your machine, and open it in a new browser tab. In my case, I open https://35.227.184.91/. Do NOT choose the address that starts 10., since that is internal. If this fails, you probably forgot to check the box next to “Allow HTTPS traffic”. 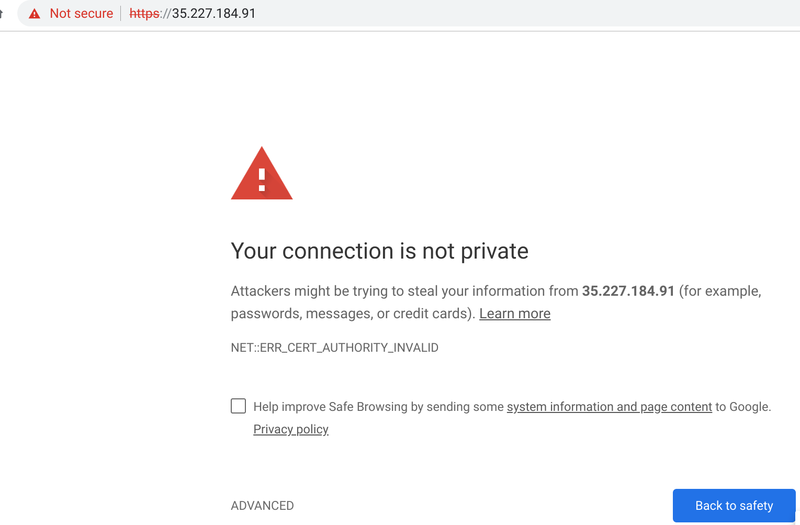 Since the SSL cert in the Docker image is self-signed, you’ll get a warning. Click through it by clicking “ADVANCED”. WARNING: Anybody who knows the IP address can make an account in the same way. 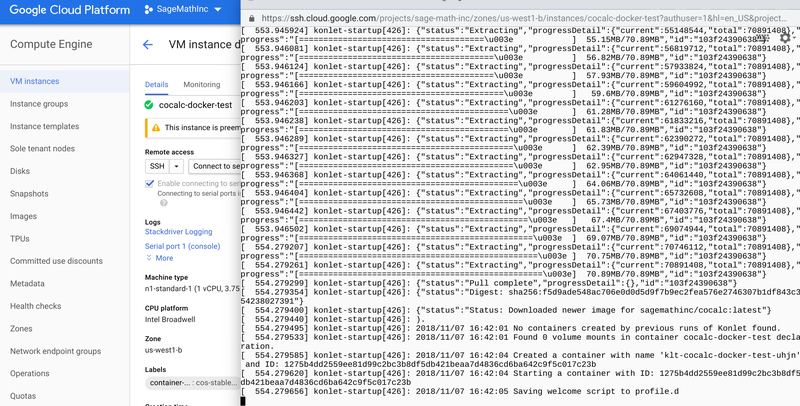 There’s no secret token, and currenly no way to configure one with GCP Container Image. See this issue. Collaborative Editing in CoCalc: OT, CRDT, or something else? This paper about collaborative editing is on Hacker News today. 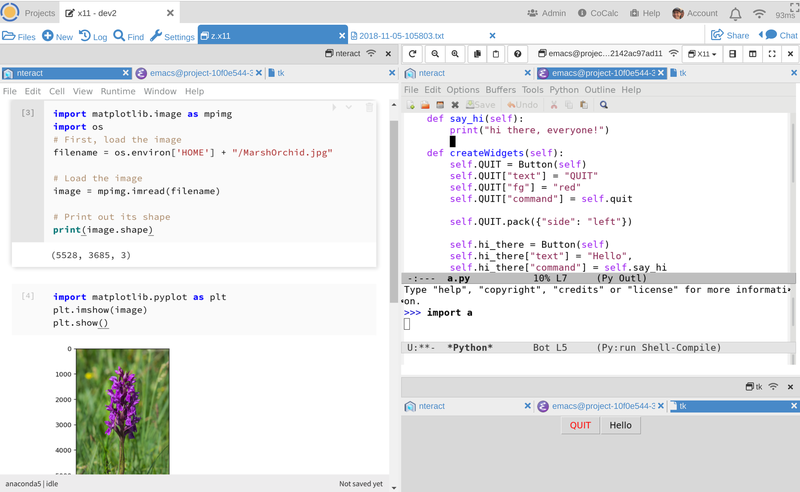 I also recently talked with Chris Colbert about his new plans to use a CRDT approach to collaborative editing of Jupyter notebooks. This has caused me to be very curious again about how CoCalc’s collaborative editing is related to the many algorithms and research around the problem in the literature. 2. causality preservation: if somebody else’s change is applied to your local version of the document, then you make a change, then your change is always applied after their change (in 1). CoCalc has 1, of course; without that you’ve got nothing. 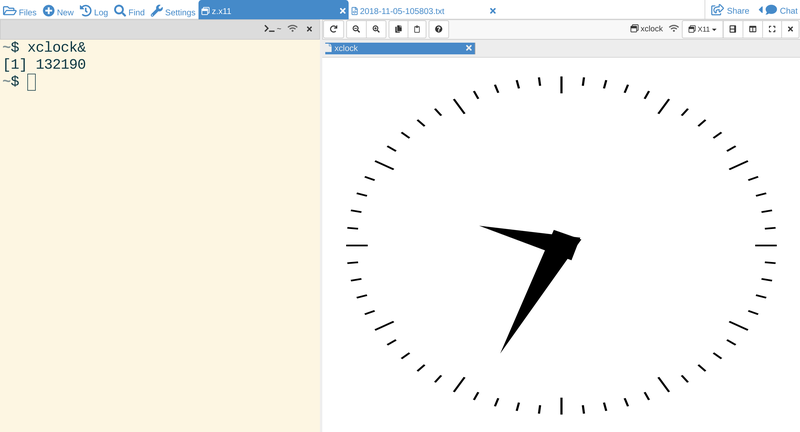 CoCalc has 2, when people’s clocks are synced, because all patches you’ve applied have timestamp less than now (=time when making the patch). CoCalc does NOT have 3, for some meaning of 3. Patches are applied on a “best effort basis”. So instead of our changes being “insert the word ‘foo’ at position 7”, they are more vague, e.g., apply this patch with this context using these parameters to determine Levenshtein distance between strings. With intention preservation, if the operation is “insert word ‘foo’ at position 7”, definitely that’s exactly what happens whenever anybody does it (‘foo’ will appear in the document) – it does not depend at all on context. With diffmatchpatch patches (which we use in CoCalc), the effect of the patch depends very much on the document you’re applying the patch to. If there is insufficient context, then ‘foo’ might not get inserted at all. Similar remark apply to how I designed the structured object sync in CoCalc, which is used, e.g., for CoCalc Jupyter Notebooks; it also applies patches on a best effort basis. This is a protocol that in theory has all of 1-3. Of course there are many, many specific versions of OT. The hard part is ensuring 3, and it can be complicated. The problem to be solved makes sense, and it can be done. The details (and implementing them) are certainly nontrivial to think about conceptually… There’s many academic research papers on OT, and it’s implemented (well) in many production systems. In OT, the data structure that defines the document is simple (e.g., just a text string), and the operations are simple, but applying them in a meaningful way is very hard. This paper on HN that I mentioned above argues that OT is much more popular in production systems than CRDT. This also does 1-3. It sets everything up so the data structure that defines the document is very complicated (and verbose), but it’s always possible to merge documents in a consistent way. What is difficult gets pushed to different places in the protocol than OT, but it’s still quite hard, and there are subtle issues involved with any non-toy implementation. CoCalc’s text editing does synchronization as follows. Each user periodically computes a timestamped patch, then broadcasts it to everybody else editing the same file. When patches arrive, each user computes the current state of the document as the result of applying all patches in timestamp order. If everybody stops editing, then they all agree on the same document. This protocol satisfies 1 and 2, but not 3. The reason is that patches are applied on a best-effort basis using the diff-match-patch algorithm. For example, a patch made from deleting a single letter in a document can, when applied to a different document end up deleting multiple letters (or none). Basically, CoCalc replaces all the very hard work needed for 3 that OT and CRDT’s have with a notion of applying patches on a “best effort” basis. The behavior is well defined (because of the timestamps), but may be surprising when multiple people do simultaneous nearby edits in a document. “There are two basic ways to propagate local edits: one is to propagate the edits as operations [12,38,50,51,73]; the other is to propagate the edits as states . Most real-time co-editors, including those based on OT and CRDT, have adopted the operation approach for propagation for communication efficiency, among others. The operation approach is assumed for all editors discussed in the rest of this paper”. Here  is N. Fraser’s paper on Differential Sync. This was the sync algorithm in the first version of CoCalc, and was the inspiration for what CoCalc currently does. In CoCalc, the data structure that defines the document is simple (just a text string, say), and the operations are less simple (computing diffs, defining patches), and applying them in a meaningful way is somewhat difficult (it’s what the diffmatchpatch library does). This approach is very easy to think about and generalize, since it is self contained and a local problem. After all, I mostly described the algorithm in a single paragraph above! In CoCalc, we compute diffs of arbitrary documents periodically, much like how React.js DOM updates work. This seems to not be needed in OT or CRDT, which instead track the actual operations performed by users (i.e., type a character, delete something). Computing diffs has bad complexity in general, but very good complexity in many cases that matter in practice (that’s the trick behind React). Diffs involve observing state periodically, rather than tracking changes. OT and CRDT really are solving a much harder problem than we solve. This is similar to how git uses the trick of “assume sha1 hashes don’t collide” to solve a much easier problem than the much harder problems other revision control systems like Darcs solve. Open three windows on the doc you’re editing. Reconnect and watch. The experts agree that the “correct” intention preserving convergent state is “aycxd” (which overleaf produces), but CoCalc will produce “acxd”. I do NOT consider this a bug in CoCalc – it’s doing exactly what is implemented, and what I as the author of the realtime sync system intended. The issue is that the patch to delete “b” has “a” and “cd” as surrounding context, and if you look at how diffmatchpatch patch application works, this is a case where it just deletes everything inside the context. The “famous” TP2 puzzle for CoCalc ends up like this (in at least 1 of the 6 possibilities!). then add an x and a y on either side of b, and delete b. Looking at the source code of diffmatchpatch, this is just what DMP does. If there is a lot more badness and the strings are bigger, it’ll refuse to delete. It really is a sort of “best effort application of patches” with parameters and heuristics; no magic there. Where does CoCalc come from? Meet the team and company that provides CoCalc. Prior to CoCalc, William Stein spent 15 years teaching and doing research using mathematical software at Berkeley, Harvard, UCSD, and Univ of Washington. Based on this experience, he launched the CoCalc web application in April 2013, under the name SageMathCloud, with the mission to make it very easy to collaboratively use free open source mathematics and data science software in classes and research. 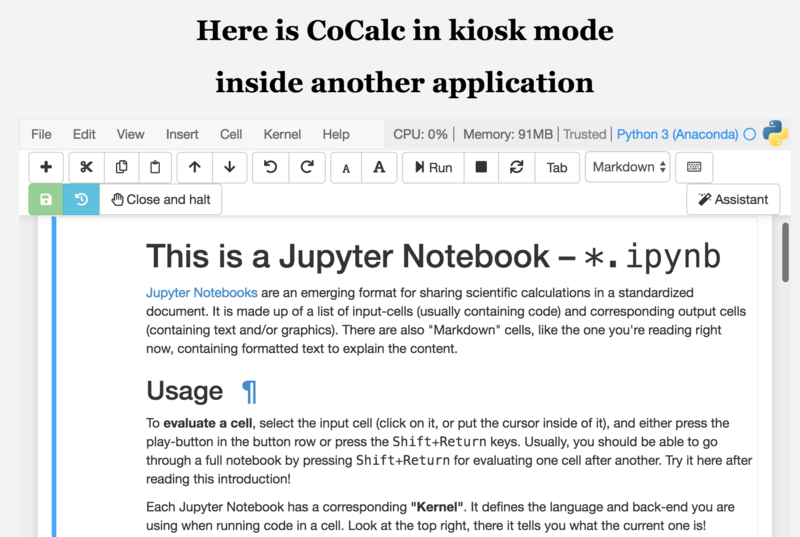 After over 5 years of extremely active development, CoCalc is now a modern web application that provides collaborative access to most free open source technical software, including LaTeX, Jupyter Notebooks, the Python numerical ecosystem, the R statistics software, and SageMath. Thus CoCalc brings together the work of thousands of contributors to open source software under one roof, which is easily accessible from your web browser. 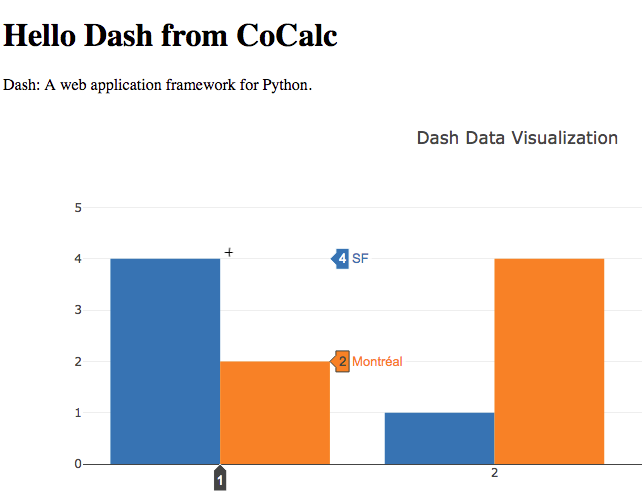 Create interactive data visualizations for collaborators in your CoCalc projects using Dash. Dash is an open-source framework to create web applications with Python. With CoCalc’s HTTPWebserver capability, you can run a Dash application from inside a CoCalc project. If you are new to coding, CoCalc makes it easy to get started. All you need is a web browser and an Internet connection. You don’t have to install software on your computer to start learning Python, R, Julia, and other leading open-source languages. 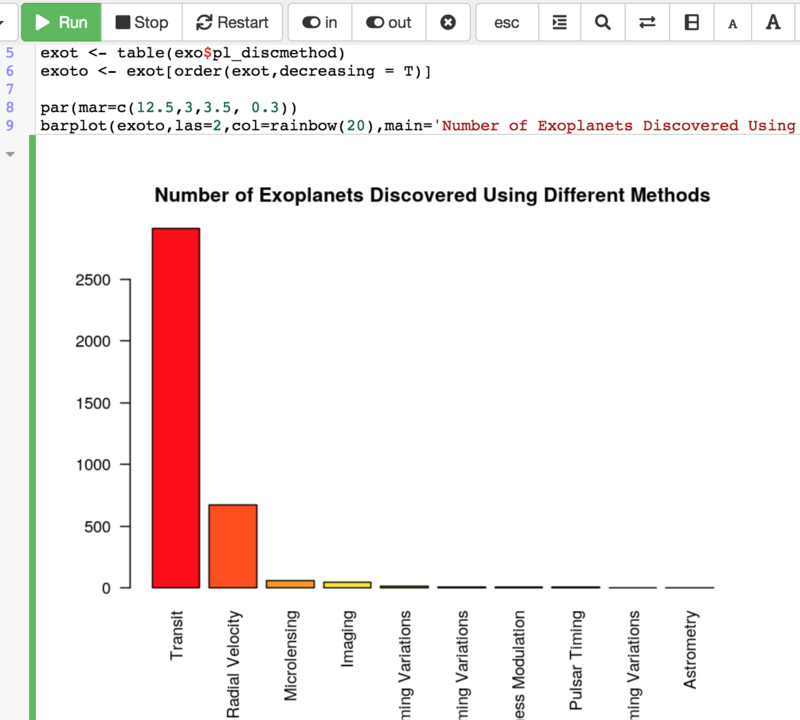 Add scientific computing to any online training platform by embedding CoCalc. CoCalc wants you to fully accomplish your computational work online. To archive this goal, CoCals has to provide a reliable service, offer and maintain the software you need, and package this in a powerful interface. The new “Assistant” is one of the latest additions to the interface. Its goal is to help you by offering a curated set of annotated code snippets. Is KaTeX ready for Prime Time? You be the judge. CoCalc now offers an option to render LaTeX using KaTeX rather than MathJax. At the moment, KaTeX is an experimental feature which is turned off by default. To enable it, open Account / Preferences, and under Other Settings, check the box next to “KaTeX: render using KaTeX when possible, instead of MathJax”. KaTeX is often over 100 times faster than MathJax, but it doesn’t handle all expressions covered by MathJax (or LaTeX). In these cases, CoCalc with KaTeX enabled will still fall back to MathJax. The selection happens for individual expressions, so one expression in a markdown file or a notebook cell might be rendered with KaTeX, while another would be rendered with MathJax.